February 17th 2015. Just over the towering hills of tiled brick and wooden homes that framed our practice field, a sad reality of gangs and child soldier recruitment exists. But there was a feeling of security and closeness as I stepped on the futbol pitch in Barrio Paraiso, and it looked as though I wasn’t the only one who felt that way. At an elevation of at least 8,000 feet, north of the capital city Bogotá, Barrio Paraiso was home to unbelievable views, steep city streets lined with street vendors, stray dogs and wind-burnt faces. 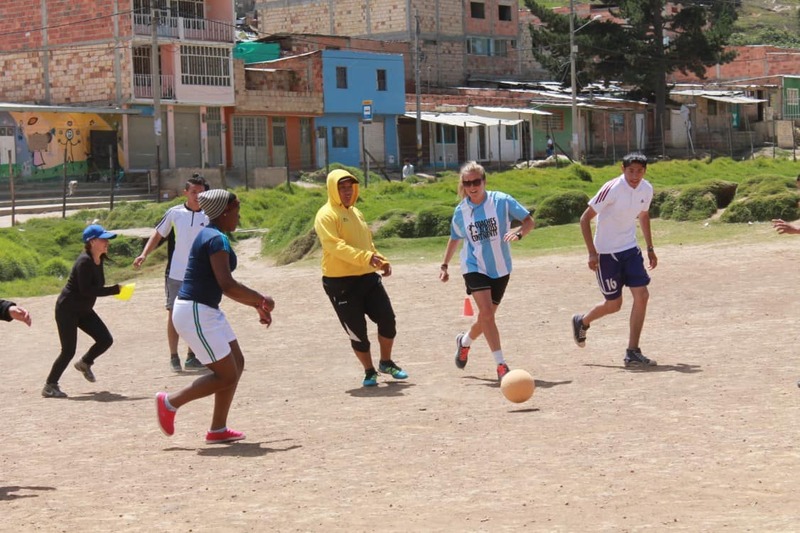 For the second week in a row we were working with Colombianitos, a sport for development NGO that functions in several different communities in Colombia. The week before this we worked at their Cartagena location. An organization where Manchester United’s Falcao played growing up, Colombianitos is a special place for the children to learn, play, and grow because of the atmosphere the coaches, mentors and teachers at this foundation have created. It is apparent when the children come by throughout the day and wrap their arms around the teachers/coaches, that this is a place they feel cared for and loved. Living conditions aren’t the easiest in Barrio Paraiso but for the 29 mentors/participants who make sport and education a priority, and the further 1,429 children in the Colombianitos family who reap the benefits of it, they are all given something to look forward to every day. This week we coached games in the morning with Colombianitos and every afternoon an organization called Tiempo de Juego travelled an hour by bus to join in on the training. 10 participants between the ages of 14 and 40; young leaders and older leaders; arrived after lunch everyday with beaming smiles on their faces. It was fulfilling to watch the two communities come together over CAC games and form a bond within the short week of knowing each other. One morning we gave the Colombianitos coaches time to create a fútbol for social impact game to train back to their peers. I was so impressed to see how creative they got when we put them to work. My favorite of the games was a game addressing the need to clean up the environment. In the game there was a soccer field with two trash bins on both sidelines. Team A was given cones to sporadically drop throughout the game to represent trash or polution in the community. Team B could only score after they picked up all of the cones that were dropped and put them in the trash bins on the sideline. The simple message of this game is shown in that the team can only succeed when they figure out a good strategy to clean up the environment. The team who throws the trash on the ground will win more often than the team that has to pick it up because they have no trash to pick up. It is a valuable message in communities like Barrio Paraiso where trash fills the streets and pollutes the land and water sources. Seeing the coaches create and coach their own games is encouraging for CAC because it is evidence that our partnership is aiding in the process of creating self-directed learners. But more than anything it is encouraging for the community itself. The people to best deal with social issues in a community are the people who live there. 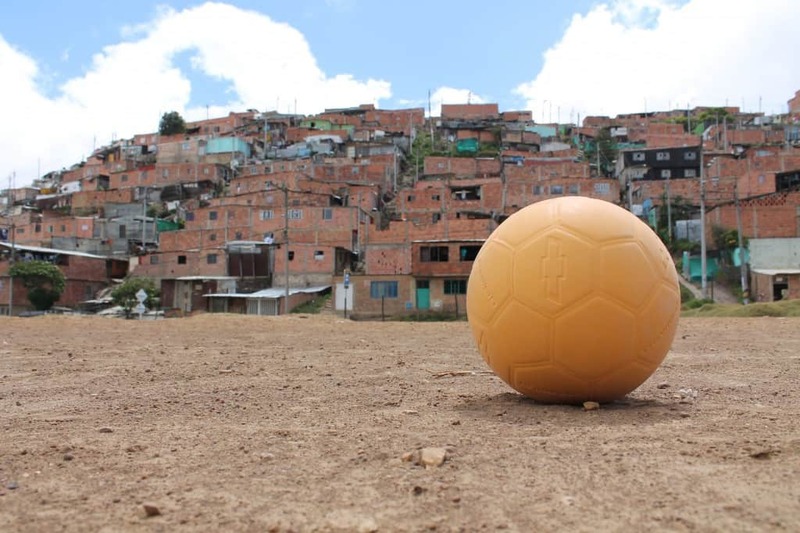 Once they are able to adapt our games to fit their society’s needs, create games on their own, and fully embody the self-directed learning methodology, CAC’s physical presence in the community will be felt through the game of fútbol, but no longer needed.